Audio Repeater allows you to transfer audio samples from one device to another with DSP processing support. You can change Buffer Count & Buffer Size if you hear gaps in audio stream. 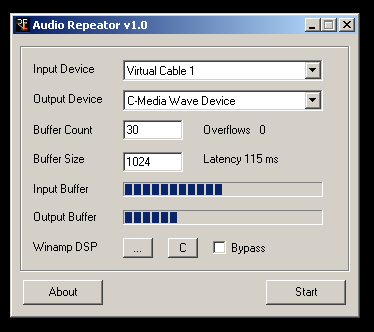 Audio Repeater use first dsp module of winamp dsp plug-in. You can use this program to apply dsp effects to line-in of your sound card real-time with minimum amount of latency. Also you can use Virtual Audio Cables if you want to apply dsp effects to the entire system. You are currently browsing the Tools & Technologies From Hasaranga blog archives for January, 2011.